Here is a simple example of the way that your brain's sophisticated technology for identifying shapes and shading can be used to produce a misleading image. We're all familiar with the layout of a chessboard, and our brains know how to process the effects of shadows. But this image is drawn in a way that specifically misleads the interpretation of those effects. It is quite clear in the image above that square A, one of the black squares, is much darker than square B, one of the white squares. In fact, though, they are exactly the same shade of grey. Thanks to Professor Edward H. Adelson of MIT for what has been my favourite optical illusion for many years. You may find it hard to believe that A and B are the same shade of grey, but the video demonstrates this. 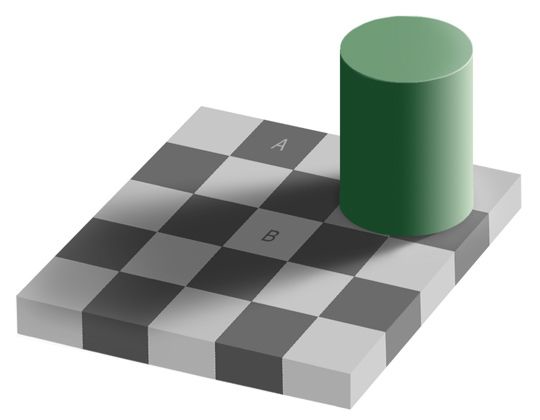 The animation merely moves the square - there is no change of shade. If you still don’t believe it, fold the page in your book to bring the two squares together.